There is a right way and a wrong way to load a Spanwell’s extra-large S Hook into the Hang-It ™ Clamp. You’ve already taken the first step in eliminating trip hazards by using our extra-large S hooks and keeping your industrial workplace safety program OSHA compliant. Once you’ve installed the aluminum Clamp onto the designated beam, tighten the setscrew by hand with the supplied allen wrench. Never replace our setscrew with any other style set screw, bolt or foreign object. 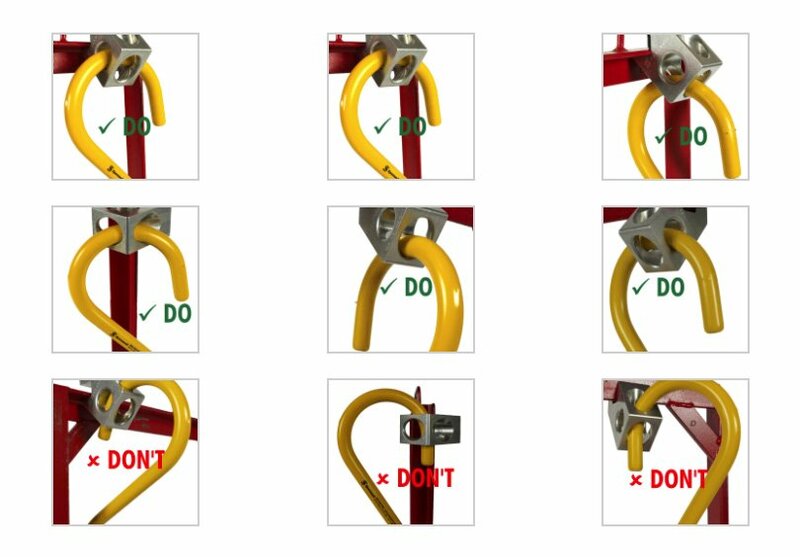 Use the images below to properly install a 9” S Hook, 12” S Hook or 14” S Hook into the Hang-It Clamp hook hanger. The Hook and Clamp together provide a safe and time efficient solution for hanging temporary lighting or stringing welding lead throughout your turnaround work area. Remove power cords from walkways for OSHA housekeeping compliance with the S Hook and Clamp.